Sky’s A Discovery of Witches presented its first-ever panel at the 2018 San Diego Comic Con featuring the series’ stars Teresa Palmer, Alex Kingston, Valarie Pettiford, and Owen Teale, as well as executive producer Lachlan MacKinnon and author Deborah Harkness. The series is based on Harkness’ bestselling books about a witch and a vampire who break the rules and fall in love. Teresa Palmer stars as Diana Bishop, a powerful witch who spent the majority of her life refusing to do magic. Matthew Goode plays Matthew Clairmont, the vampire who is fated to be a part of Diana’s life. In addition to hosting a Q&A with fans, the A Discovery of Witches team participated in roundtable interviews to discuss the show’s first season and the challenges of bringing the book to life on the small screen. 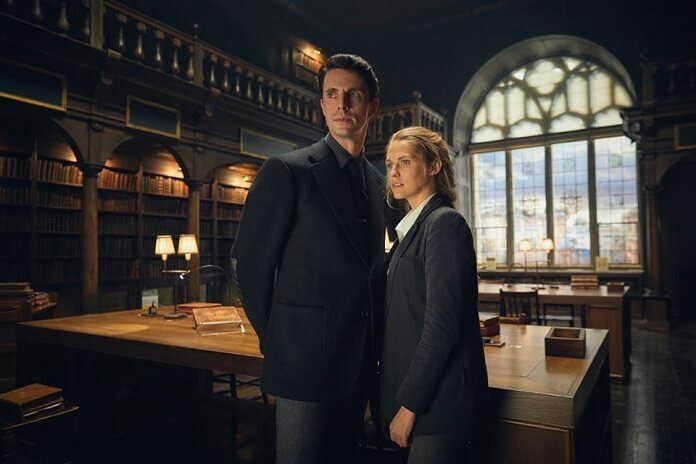 Teresa Palmer was paired up with executive producer Lachlan MacKinnon during the interviews, and the pair not only provided insight into the show’s first season but also showed off the series’ version of Ashmole 782, a book that plays a pivotal role in Harkness’ book series. Congratulations on the deal with Sundance to air the series. Has that been in the works for a while? What was the process for you to land the role? Teresa Palmer: “I was sent the script by my agent, read it, fell in love with it, thought it was a wonderful role. I was like, ‘Help me! How do I get this job!’ I actually met with (executive producer) Jane Tranter last June, maybe, and I thought she was such an intelligent woman. The way she broke down the world and the story and the character arc, it sounded so enticing and I wanted to be a part of it. For those who aren’t familiar with the books, can you describe Diana? Teresa Palmer: “She’s a historian, an academic, she’s very interested in alchemy and she’s currently studying. She’s a witch as well. She’s denying her heritage. She wants to be a normal person. She wants to live a normal life. She’s struggling against the fact that she does have powers and she is a witch. She wants to deny that part of herself. And then as the story unravels, she’s forced to embrace who she is and really become her authentic self, which is the most powerful witch around. She falls for Matthew Clairemont and he helps her to just embrace who she is. Were you familiar with the books before you took on the role? Teresa Palmer: “I wasn’t, actually. I have three children and I haven’t read books in a long time. (Laughing) I think I just missed the boat on reading the books, and then of course when this script landed on my doorstep I jumped into the books. I actually did the audiobooks because I can drive and listen. When the kids were asleep I put the audio books on because they weren’t quite appropriate for a three-year-old. So, I would listen to the audio books. How do you feel about delivering on the anticipation by fans of a series based on the books? So much of what we learn about Diana and her magical abilities has to do with how things smell and feel. How does that come across in the series? Teresa Palmer: “Yeah, it’s really interesting because in the book she’s the narrator so you’re hearing through her voice which you can’t really do that in a television show. So, it was quite interesting to figure out how do we explain the magic and her feelings without having narration. Will we see anything from the second book or does it concentrate only on the first? What did you learn about witchcraft that you didn’t know before? Will we see Diana on horseback? Teresa Palmer: “Yes. You probably saw a little bit of it in the trailer. It was great because I haven’t ridden horses since I was 12 and then I got to go…We worked with the Devil’s Horsemen who did Wonder Woman and all these amazing big films and they provided the horses for them. So, Matthew and I both did about six hours-worth of horseback riding, just training and learning to be with the horse. And then we had a day of filming with them and got to cantor and take them for a trot. Projecting into the future, is it the plan to be three seasons? Any plans to branch out to original material?